Hawaiian Springs Water sponsored the inaugural Hawaii Food & Wine Festival held at various Waikiki locations from Sept. 29 to Oct. 1. Hawaiian Springs donated more than 7,500 bottles of water to the festival, which were enjoyed at both the daytime and nighttime events. 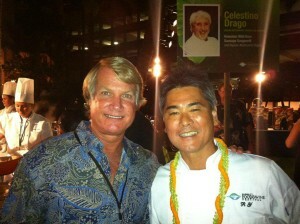 The 11-event festival featured celebrity chefs and master sommeliers, and was attended by over 1,000 people. The festival featured three signature events, in addition to a number of daytime events including a class on food entrepreneurship, “Farm-to-Glass” cocktail lesson and coffee and chocolate pairing. One of the most popular daytime events was the sold-out “Private Picks: Master Sommelier’s Favorite Producers,” which allowed participants to taste 12 top-tier wines, as well as a bottle of Hawaiian Springs’ young natural artesian water. Overall, the 3-day festival hosted 32 world-class chefs, four master sommeliers, nine top-tier winemakers, and local farmers and food producers from around the world. The weekend offered exciting celebrity chef sightings, including culinary master and Bravo’s Top Chef judge Hubert Keller; Top Chef (season two) finalist Marcel Vigneron; and Food Network’s Iron Chef America winner Mourad Lahlou. Proceeds from the festival benefit the Hawai‘i Agricultural Foundation and the Culinary Institute of the Pacific. The festival was co-chaired legendary chefs and two of the founders of Hawai‘i Regional Cuisine, Roy Yamaguchi and Alan Wong. Hawaiian Springs began bottling its young, natural, artesian water in February 1995. Drawn from a highly sustainable artesian aquifer at the base of Mauna Loa on the Big Island of Hawaii, Hawaiian Springs bottles its water directly from the source within 30 days of falling as Arctic rain. Hawaiian Springs is one of the finest natural waters available today, with a distinctive, slightly sweet taste and delivering a moment of what makes Hawaii special. Hawaiian Springs is available throughout the Hawaiian Islands, as well as the U.S. mainland, Canada and Asia, at leading supermarkets and natural food retailers such as Lucky’s, Bristol Farms, Raley’s, BelAir, Nob Hill Foods, Henry’s Farmers Market, Gelson’s Markets, Mollie Stone’s, Mother’s Market, SaveMart, Sprouts Farmers Market, Vitamin Cottage Natural Grocers and Whole Foods. A store locator and webstore are available at www.HawaiianSpringsWater.com/blog/products. For additional information, visit www.HawaiianSpringsWater.com, like the company at www.facebook.com/HawaiianSprings, or follow them on Twitter at www.twitter.com/HawaiianSprings.